Google has just presented its new Pixel 3. In theory, this much-anticipated handset should represent the best all-round Android experience directly from the OS creator. But Google isn't the most popular Android manufacturer. So it's logical to take a look at how what's new from Mountain View compares against this year's flagship from Samsung. A smartphone is your daily companion, so you'll want to choose one that will feel comfortable in your hands and pocket. The Galaxy S9 measures 147.7 x 68.7 x 8.5 mm with a 5.8-inch screen diagonal and weighs in at 163g. The Pixel 3 has 5.5-inch display diagonal and will, therefore, be a better option for those who like a more compact smartphone. And lord knows, some people are getting really sick of the trend towards ever-larger screens. On the other hand, gamers and those who love to watch video on the go may well be better enjoying media on the larger Super AMOLED display found on the Galaxy S9. Of course, if you can't wait to play Fortnite on your Android phone, you can already do so on the Galaxy S9, although the Pixel 3 will be capable of running it in the future. When you're shopping for premium smartphones, you've got to have an eye for style too. Of course, this is a matter of taste, with both Google and Samsung having setting into distinct visual languages. 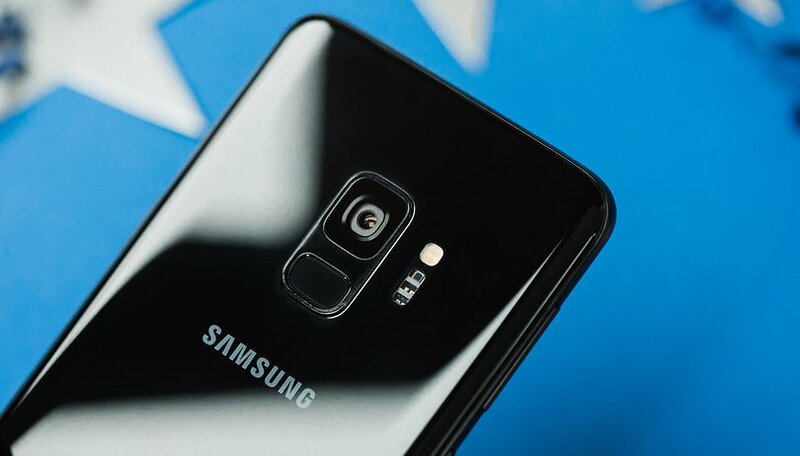 With smooth curves that blend into the Infinity Display (especially on the black model) Samsung's Galaxy S9 is sleek and futuristic looking. The Pixel 3, on the other hand, goes with the two-tone style that we already know from the previous generation. While it forgoes the ugly notch of its big brother, it still adopts a more 'classic' smartphone look, and in my opinion, doesn't quite match the elegance of the S9. However, design elegance is but one thing...elegance of software is another, and that's where team Pixel always has an advantage. Are there really so many who prefer Samsung Experience over pure Android? Samsung's UI comes with several bells and whistles, often alongside Google's superior offerings. Who prefers Samsung's browser to Chrome? Or Bixby to Google Assistant? In contrast to Samsung's often bloated software suite, the Pixel 3 promises purity, speed, and efficiency. With both software and hardware 'made by Google', the Pixel phones set the standard for an optimized, 'just works' user experience that's the envy of other OEMs outside of Cupertino. And that's before you consider the fact that the Pixel 3 will be the first to receive updates and security patches, meaning that you'll always have the most cutting-edge stable Android version on your handsets. Contrast this to Samsung's woefully slow record of software support, with new Android versions often taking months before (sometimes problematic) rollouts. Sorry Samsung, you can't compete here. The previous generation Pixel phones stand up as the best cameraphones of their generation, so of course expectations are high for the Pixel 3. Naturally, Google is keen to uphold their reputation. But before we swallow the hype, it's important to put the Pixel 3's snapper to the test just like we would any other smartphone. Of course, the Galaxy S9 is no slouch in the camera department. We examined the photographic capabilities in detail and produced some really beautiful photos. But, let's not forget, the Pixel 2 still managed to beat the Galaxy S9 (and everything else) in our last camera blind test tournament, so we'd expect the new generation to handily leave the Galaxy in the dust. Even if we'd bet on Google for this point, we'll have to wait for the fun of testing the Pixel 3 camera properly to deliver a final verdict. But with enticing features such as an AI-assisted night mode and Top Shot, which combines several quick snaps in succession to select the best outcome. When it comes to hardware, it's quite a close race as you can see from the table above. Both contenders are equipped with Snapdragon 845 chipsets, 4GB RAM. Samsung's battery seems more robust, but Google's efficient optimization may yet mean more autonomy for the Pixel 3. Storage-wise, the Galaxy S9 ranges from 64GB to 256GB, which tops out at higher than the Pixel's 64/128GB, but if you don't mind Google's reliance on cloud storage, this may not be an issue for you. Google throws in unlimited cloud storage with the Pixel phone for up to 3 years. Both smartphones will cost you dearly. The Pixel 3 costs $799 (64GB) or $899 (128GB). The Galaxy S9 on the other hand, is a both older and cheaper, at $620 for 64GB, $670 for 128GB and $740 for 256GB. By going Samsung, you save significantly and potentially get more storage in the bargain as well as the benefit of the larger Infinity Display for media. On the other hand, fans of Android software, smart home and photography may well consider the extra price of the Pixel 3 to be more than worth it. Note: This is a preliminary comparison based on our first impressions of the Google Pixel 3. As we spend more time with the device, we will update this article with our comparison on battery life, photo quality and other aspects that requirelong-termm testing. Do you think the Pixel 3 does enough to beat the Galaxy S9? The Pixel is the Android king. But that doesn't mean I want one. Galaxy S9 is threatening the throne of Pixel 2 XL but I'll stick with Pixel 2 XL. Like a Pixel 2 XL giveaway.